I just got some new Oakley Jawbone with prescription lens. My eyes are about -3.0d for correction, and that gets a little funny with the optics towards the sides of the lens because they’re so wide. I was hoping for a prescription eyewear that gave me the same peripheral vision as contact lens. This isn’t the first sports shade with RX lens that I’ve tried; I picked up some Rudy Project Horus a few years ago. But the visual distortion at the periphery gave me a headache. Also my pseudo Asian facial features and oddly long eyelashes, which eliminate many of the frame styles available, meant that I had to adjust the nosepiece in such a way that focal center of the lens ended up in the wrong place perhaps. I ended up considering Oakley because I have long had RX casual eyewear from Oakley that had excellent optics and quality frame construction. An early season burst of allergies, which dramatically affects my ability to wear contacts comfortably, prompted me to pursue new glasses for riding. I’ll write up a more involved review later, but let me just say this about these RX sports eyewear. When you wrap a prescription lens around the face as much as the Jawbone does, it is a challenge to get the optics to perform without too much visual distortion. The field of view of the Jawbone is awfully close to my full natural arc, but it would be inaccurate to say that wearing the RX Jawbone is the same as wearing contacts. Your eyes, or to be more accurate your brain, must adapt somewhat to wearing these glasses. The moment I tried this RX shade on, I had the sinking feeling that it was going to be an unsuccessful and very expensive repeat of the Rudy RX failure. However, 8hrs later I had largely adapted to the point that I can swap between contacts and the Jawbone with minimal effort. I am going to hold off from declaring these Oakleys to be the greatest thing ever, but so far the results have been very encouraging. One last note: The styling of the Jawbone is anything but subtle. 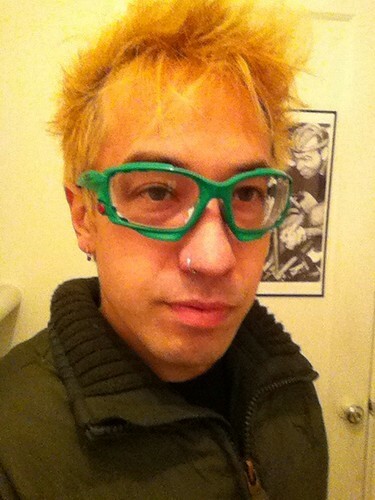 On a whim, I ordered the frame in all-green, because why just question good taste when you could shoot to really offend?